Several years ago, Rolf Penterman packed up their Dutch dairying ways and moved to Thorp, Wisconsin to open their farmstead operation. Later, Marieke joined and started to craft their mind-blowing goudas. A mere four months after completing their first batch of goudas, they took home a gold from the U.S. Champion Cheese Contest, the first of over 100 awards for one of America’s most decorated cheesemakers. Ultra-melty Fenugreek Gouda has hints of maple-syrup, thanks to the infusion of fenugreek, and we always say, More cheese, please! when this one Wisconsin original is close at hand. Take your Fenugreek Gouda out of the refrigerator 30-60 minutes before serving it. If it has the plastic, food-grade rind, remove it before serving and watch the happiness unfold all around you. 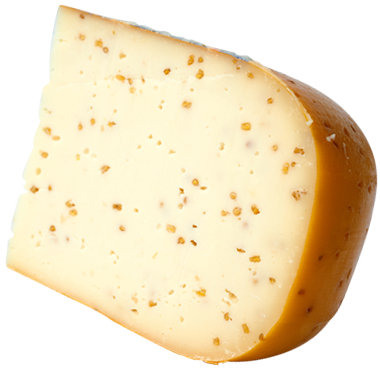 This nutty, slightly sweet gouda gets along well with beverages with similar flavor profiles. We particularly like to drink port, brandy and dark sweet rum with it. For beer, sweeter ones like bock, amber ale, and a fruitier saison ale are lovely. Wines that pair well with it include riesling, müller-thurgau, gewürztraminer, sauvignon blanc, cabernet sauvignon and beaujolais. Everything is gouda (sorry pun haters!) when Fenugreek Gouda is on offer. We adore this Dutch-style, raw-milk gouda on top of crusty, toasted, whole grain bread drizzled in honey or with no drizzle at all. It also goes well on a board with toasted almonds and a medley of fresh and dried fruits. Some of our favorite things to do with it cooking-wise: cheesy, buttery Wisconsin potatoes and melty yummy omelets and scrambles.